Before proceeding with today’s article, three recent events that took place are worthy of commentary. Last Friday witnessed the debate in the National Assembly of a motion of no confidence in the Government that was tabled by the Opposition political party. At the conclusion of the debate, a vote was taken, which saw the approval of the motion by 33 votes in favour to 32 votes against. … the Government shall remain in office and shall hold an election within three months, or such longer period as the National Assembly shall by resolution supported by not less than two-thirds of the votes of all the elected members of the National Assembly determine, and shall resign after the President takes the oath of office following the election. (d) Respect the outcome of the new elections expected to take place within the next three months. We must not allow our thoughts and actions to be swayed by sentiments. If we fail in these endeavours, our country can be torn apart. Let us display that level of maturity necessary to keep our country together and to enable it to develop and grow. During the debate in the National Assembly on the 2019 Budget Estimates, the Opposition argued that the Prime Minister should vacate his seat in the Assembly because he was performing duties of the President while the latter was undergoing medical treatment overseas. Whenever the President is absent from Guyana or considers it desirable so to do by reason of illness or any other cause he may, by direction in writing, authorize any member of the Cabinet, being an elected member of the National Assembly, to perform such of the functions of the office of the President as he may specify and the person so authorized shall perform those functions until his authority is revoked by the President or until the functions are resumed by the President. It is not clear whether the President has given directions in writing for the Prime Minister to perform some or all of the functions of the Presidency. Nor it is clear if the Prime Minister took and subscribed to the oath of office, as required by Article 97(2). Until these are determined, it would be premature to argue a case for the Prime Minister to vacate his seat in the Assembly. The Opposition does, however, have a case on the assenting of the Appropriation Bill. Having participated in the budget debate and having voted in favour of the Bill, it would be inappropriate if the Prime Minister were to sign the Bill in his capacity as Acting President. In previous articles on the anticipated oil revenues from royalties and share of profits that Guyana is expected to receive, we had based our calculations on the price of crude oil being US$50 per barrel. At the time of writing, the price has dropped to US$45.59 per barrel due to concerns about over-supply coupled with falling demand. 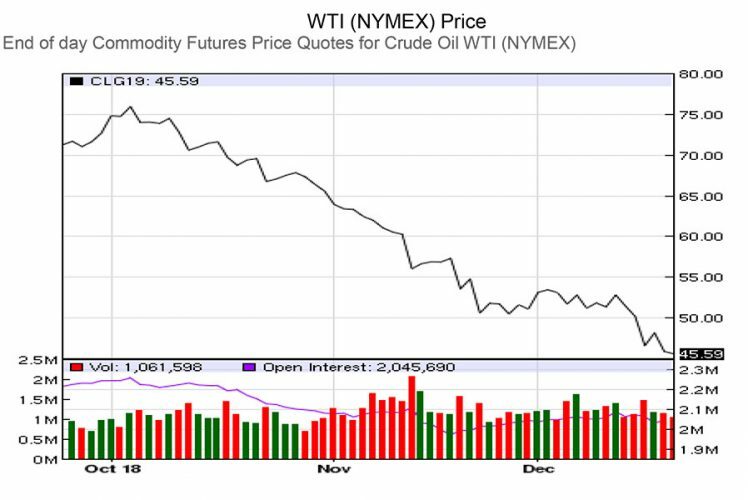 The graph below, taken from the Nasdaq website, shows the steep drop from around US$76 per barrel in the last two months or so to US$45.59. Some 187 countries are signatories to the 2016 Paris Accord on Climate Change which provides for the replacement over time of fossil fuels for energy consumption with renewable sources such as from wind, hydro-power and solar energy. Norway is now in the forefront in its commitments under the Accord. Currently, 30 per cent of its new vehicles are electrically powered, and by 2030, Norway is expected to reduce emission of greenhouse gases by 40 percent based on 1990 levels. One need not be reminded that for every gallon of fuel that a motor car burns, 20 pounds of carbon dioxide are released into the atmosphere! We raise these matters because of the need to temper our expectations, given the volatility of crude oil prices on the world market. Based on ExxonMobil’s production schedule, our oil resources will be completely exhausted by 2038. We therefore cannot, and should not, place all of our eggs in one basket and become over-dependent on oil revenues. Our economy needs to be sufficiently diversified to avoid any possible shocks based on recent trends in crude oil prices. Oil revenues, if and when they materialize, should be considered a bonus, indeed a windfall gain akin to the winning of a lottery! It would therefore be unwise to neglect our traditional economy because oil revenues are on the horizon. In the long-run, oil revenues are a one-off occurrence. Now for today’s article. The Chief Executive Officer of the Small Businesses Bureau of the Ministry of Business has stated that with effect from 1 January 2019 small businesses will be able to access 20 percent of government contracts for materials/services and works, based on a Cabinet decision of October 2019. He indicated that the Bureau would screen these businesses to avoid big companies setting up small businesses to front for them. He further stated long-established small businesses would be given preference over new entities based on a points system. furtherance of a charitable or political purpose. A small business desirous of becoming an Approved Small Business must make an application to the Small Business Council and provide the necessary documentation that it has met the above criteria in addition to submitting certificates of compliance from the Guyana Revenue Authority and the National Insurance Scheme. Based on a recommendation of the Council, the Minister will issue a declaration of Approved Small Business status of the business. Section 7 of the Act provides for the establishment of a Small Business Development Fund to provide: (i) support and access to financing for small businesses; (ii) non-financial services and assistance to help small businesses improve their productivity and competitiveness; (iii) institutional support for organizations representing, promoting, supporting and strengthening small business; and (iv) funding the expenses of the Council and the Bureau. By Section 11, the Government is required to use its best endeavours to ensure that at least 20 percent of the procurement of materials/services and works required annually by the Government is obtained from small businesses. For this purpose, the Small Business Council must prepare annually a Small Business Procurement Programme. Procurement is to be based on competitive bidding and in accordance with the provisions of the Procurement Act 2003 and the regulations in force. The Council is also required to prepare and submit to the Minister an annual report on the progress made in implementing the Small Business Procurement Programme, forming part of the Annual Report on Small Business. (f) Achieving transparency in the procedures relating to procurement. There is no provision that allows for preference to be given to a particular group of suppliers or contractors, as provided for by the Small Business Act which specifically refers to adherence to the provisions of the Procurement Act. Since the latter is the Principal Act governing public procurement, it would be necessary for the appropriate amendment to be made to give effect to the requirements of the Small Business Act. Any such amendment should include the maximum threshold below which small businesses can benefit from the award of government contracts. Considering that an Approved Small Business must not have an annual income of more than $60 million, the threshold could be: $15 million for goods and services; and $7.5 million for construction/maintenance works. It would also be appropriate for the type of goods/services and works that would qualify for consideration under the Small Business Act to be clearly defined. This is necessary to avoid comprising on the quality of certain goods/services, for example drugs and medical supplies, and works performed. The overriding consideration is that reputable suppliers and contractors must be engaged in government procurement. Care must also to be taken to avoid contract-splitting in order to meet the 20 percent requirement for small business. Contract splitting is prohibited under the Procurement Act. It would have been more appropriate if the Small Business Act had referred to the threshold suggested in the preceding paragraph, rather than to the 20 percent. The application of the latter is unlikely to be achieved without breaching the Procurement Act.